Is Brooklyn Industries the Idiot’s Ben Sherman? I used to go crazy for the Brooklyn Industries logo (since I heart watertowers) and their stylish carry-away bags. But yesterday after spending a good amount of time at the Ben Sherman flagship store on Spring street, I realized that every piece of clothing that I liked at Ben Sherman was also available at the same price or even a bit higher at Brooklyn Industries. I know that fashion has trends, but does that mean that each designer will have the same outfits with the only difference being their tag? All I know is that I’m confused. Wanna be a superhero? Shop your way into it. Holy crud! We’ve all dreamed of being Batman, Superman, Batgirl, Catwoman and all sorts of superheroes. We’ve idolized our comic book heroes and wanted their super powers. If you had a super power what would it be and why? is a question that you must ask before graduating high school. It is a requirement to have this discussion! Now, you can fulfill your dreams. Though in your early to mid twenties, this fantasy is no longer a sign of absolute 100% mental health, the world is a beautiful place that caters to all lunacies/desires. The Brooklyn Superhero company on 5th Avenue in the Park Slope area has everything you need in order to become a superhero. Capes, masks, certificates, ninja nunchucks? Who knows? Their Website lacks information, but you can read all about them here on Yelp. Posted in Off the Beaten Track in..., Only in New York, Shopping | Comments Off on Wanna be a superhero? Shop your way into it. The entire gloom and doom scenario….of the tanking economy, had not been felt in NYC as much as it was all over the US. That is of course if you dont count Wall Street. However, its slowly showing up in more visible ways, with the closure of commercial establishments. Below are some pics from a CNN ireport. What’s the scene in your nabe ? It will be interesting to see if the proposed boycott of Israeli products goes through at the Park Slope Food Co-Op. Read this article in CrownHeights.info for the full story. New York City’s largest and longest-established food co-op is frequented by various segments of the population, both Jewish and non-Jewish. And among Jews, shoppers run the gamut from Orthodox and Hasidic to Reform and even non-observant secular Jews. It is not unusual for the co-op to take a political stand, reflecting the tradition of the community in which it is situated. This latest proposal would be in protest of Israel’s recent activities in Gaza. A local Brooklyn rabbi believes that the proposal will not pass but, if it does, it will seriously impact the co-op’s membership. I just got back from McNally Jackson – an independent bookstore – located in Nolita. It was packed with people talking, browsing and having food at the cafe within the store. The store is not too big, but it’s set up in a way that captivates your attention immediately. So after 30 minutes of being there, I had yet to go over to the cafe or notice that they have a downstairs. I left those 2 out of my experience this time around as their collection of graphic novels and books on design/architecture and various other things kept me occupied. I was surprised I hadn’t noticed the place after being through Nolita several times. Not since Coliseum Books have I really loved a bookstore so hard in New York City. Definitely going again and checking out the downstairs. After my post about Black Friday madness I woke up to find a serious note: a Wal-mart employee in Valley Stream was killed by a stampede of people shopping during Black Friday. We all do our part in contributing to the insanity and if the retailers would make the events last just a while longer it could save such trouble. It’s all a Catch-22. If you increase the hours of the sale then not as many people will come shop for goods and then the day would no longer be Black Friday. It would just be another sale event. And if companies like Wal-Mart know that their employees are going to be facing unusual volume, they should take security measures prior to the day. But then again Wal-Mart is rated as one of the worst companies to work for so I can’t imagine them having this sort of insight. I sincerely am sorry that a person actually died because of a sale. Black Friday brings out the worst in New Yorkers and shoppers everywhere. We forget that all of us have the same essence running through ourselves. Just because we’re not related to one another, we forget common decency. Today, I was guilty of letting my ego get the best of me. Large crowds, lots of noise, very few items with deep discounts and the rush of making sure that you get everything on your list completed drives Black Friday to be one of the most stressful days of the year. So, this is my confession…I cut in line today, twice. Once at the Best Buy in Westbury and the other time to get into the busy parking lot of the Best Buy in Westbury. I turned left from the right lane, nearly crashing into oncoming traffic. Then I went into the right lane again and entered the busy Best Buy parking lot, again nearly crashing into oncoming traffic. Once I found a parking (luckily, no illegal actions had to be made here), I rushed inside and perused through the merchandise.There was a man who was playing street hawker and yelling “Get your Bluetooth headsets here, $25. Get ’em here.” He was quite good and got a lot of people’s attention and sold a lot of merch. I found the digital camera I wanted to get from the store and noticed that the line spanned the entire length of the store and went up and down several aisles – 5 or 6 to be exact – I was going back to put away the camera and just purchase it from another store when the opportunity presented itself. . . there was a barricade and the only place to turn was onto a register. Behind me a Best Buy employee yelled something and I thought I had been caught, but she yelled again, “ED!” She was calling for Ed. Not me. I was safe. So after the family ahead of me finished making their purchase, I made mine. Do you have any Black Friday confessions? 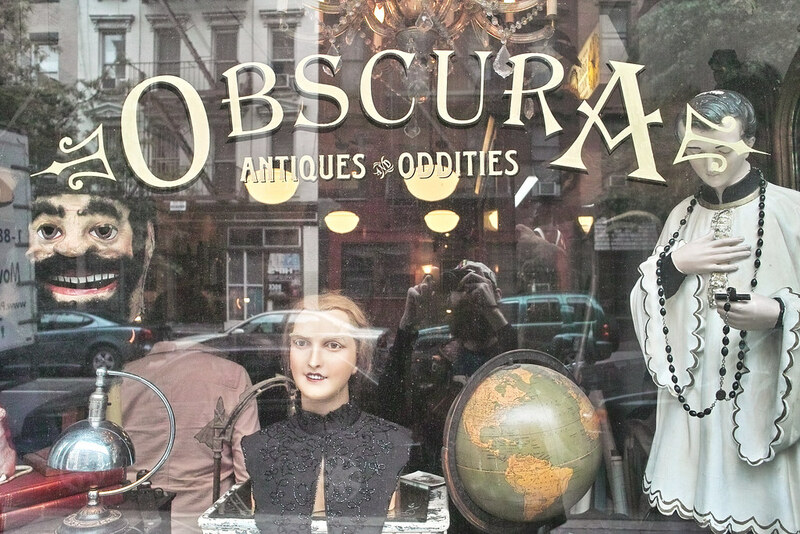 I went into a wonderful little shop this weekend called Obscura. A treasure trove of bizarre and wonderful things. Open in their new location at 280 East 10th St. I highly recommend a visit. Their captivating wares are constantly coming and going with new things in all the time.